There are generally discounts out there to senior citizen and small children. Find out by contacting your nearest pool in California. Most of the Outdoor Pools in California offer both open lanes for independent swimming and also guided activities like water aerobics or aquabike. These are the Pools other users have reported. Are you a local and your pool is not listed? Contact us to ADD IT. It's free of charge! Swimia.com desires your feedback to ensure all the information is valid, since perhaps this pool is no longer open to the public. Swimia.com has the most up-to-date database about Outdoor Pools in California. Water sports are increasing especially in elderly population sectors who have suffered some style of muscle or bone damage. Let us let you know a secret to switch off while you are in San Francisco: just choose a Swimming Pool in San Francisco and plunge into the water! There's no extra helpful method. Holding an estimated population of 3.792.621, Los Angeles is one of the most important cities in California. Check all the Swimming Pool in Los Angeles and its surrounding area. It's hard to visit California without dropping by Fresno (with 494.665 residents). 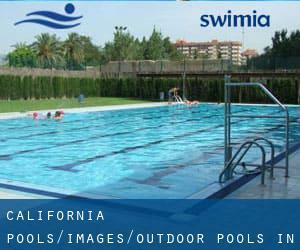 Currently Swimia is showing you all the Swimming Pool in Fresno and the closest pools located in its vicinity. Without a shadow of a doubt, swimming in San Diego could be the most effective solution to unwind after work. Take a couple of minutes to browse Swimia's catalog to find a Swimming Pool in San Diego. Swimming is a excellent idea to keep your body active during your visit to Sacramento (California), or even if you are a local. Swimia helps you to find your closest Pool in Sacramento. Updated on 2019 6314 Fair Oaks Boulevard , Carmichael , CA , USA (Postal Code: 95608). Among all the activities offered by the center, in case you are keen on swimming you can enjoy 25 meters lap pool, Outdoors. Just in case you would like to contact this Swimming Pool before dropping by, we only know the phone number. Updated on 2019 3455 Skyway Dr. , Santa Maria , CA , USA (Postal Code: 93455). Swimmers like you reported 50 feet x 27 feet, Outdoors. Unfortunately we do not have the email address of this Swimming Pool, but we can give you the phone number. Updated on 2019 32250 Triunfo Canyon Rd. , Westlake Village , CA , USA (Postal Code: 91361). Among all the activities offered by the center, if you are considering swimming you might enjoy 25 meters, 6 lanes (4 marked), Outdoors. Just in case you want to get in touch with this Swimming Pool before dropping by, we only know the phone number. Updated on 2019 819 N. Harbor Dr. , Redondo Beach , CA , USA (Postal Code: 90277). Swimmers like you reported 25 yards, 3 lanes, Outdoors. Unfortunately we do not have the email address of this Swimming Pool, but we can provide you with the phone number. Updated on 2019 49-499 Eisenhower Drive , La Quinta , CA , USA (Postal Code: 92253). This sports center offers 25 yards x ~8 feet, Outdoors. Contact information and facts for this Swimming Pool such as phone number and email address are number. Updated on 2019 8 Ford Rd. at Carmel Valley Rd. , Carmel Valley (Monterey Co.) , CA , USA (Postal Code: 93924). Among all the activities offered by the center, for anyone who is interested in swimming you will delight in 20 yards, Outdoors. Just in case you want to get in touch with this Swimming Pool before dropping by, we only know the phone number. Updated on 2019 18800 MacArthur Blvd. , Irvine , CA , USA (Postal Code: 92715). This sports center offers 85 feet, Outdoors. For this Pool, only phone number is number here. Updated on 2019 6401 Skyline Drive , San Diego , CA , USA (Postal Code: 92114). Swimmers like you reported 25 yards x 25 yards, 6 lanes, Outdoors. Unfortunately we do not have the e-mail address of this Swimming Pool, but we can give you the phone number. Updated on 2019 200 Norwegian Ave. , Modesto , CA , USA (Postal Code: 95350). Among all the activities offered by the center, if you're interested in swimming you will enjoy 25 yards, 6 lanes, Outdoors. If you'll want to contact this Swimming Pool, email address and phone number are both number. Updated on 2019 3331 Torrance Boulevard , Torrance , CA , USA (Postal Code: 90503). This sports center offers Olympic size x 20 meters, Outdoors. For this Swimming Pool, only phone number is number here. Updated on 2019 30801 South Coast Highway , Laguna Beach , CA , USA (Postal Code: 92651). Few days ago a regular user of this center told us they offer 25 yards, 3 lanes, Outdoors. Furthermore, they keep in good conditions 30 yards x 34 feet, Outdoors. For this Pool, only phone number is number here. Updated on 2019 3169 Roundhill Road , Alamo , CA , USA (Postal Code: 94507). Few days ago a regular user of this center told us they offer 25 yards, 6 lanes, Outdoors. Furthermore, they keep in good conditions 20 yards, 3 lanes, Outdoors. For this Swimming Pool, only phone number is number here. Updated on 2019 1 Lewis Foster Drive , Half Moon Bay , CA , USA (Postal Code: 94019). This sports center gives 25 yards, 6 lanes, Outdoors.